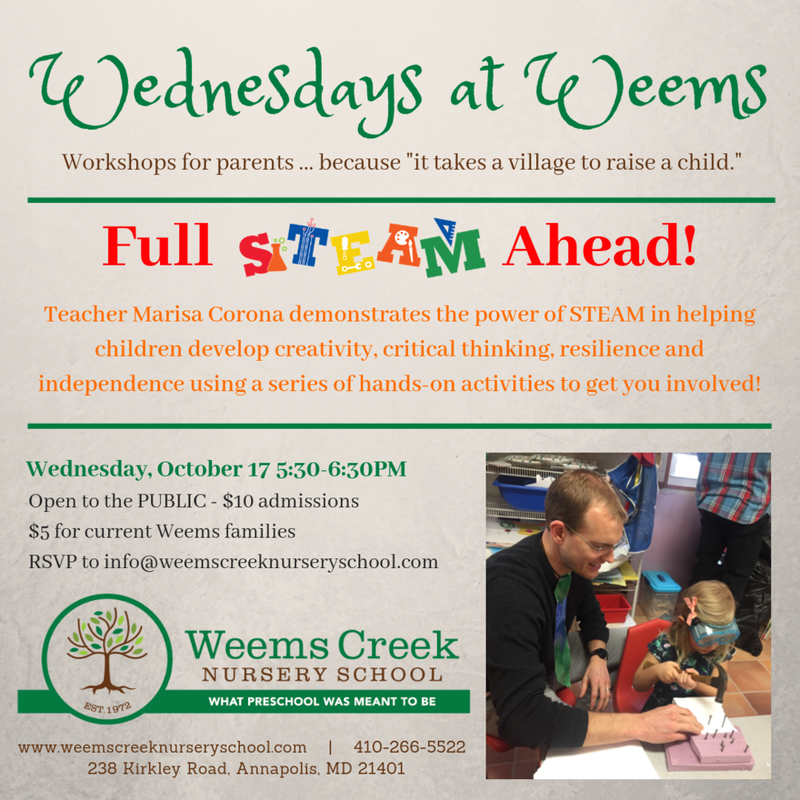 We invite parents of children aged 2-5 to join us for a sneak peak into the magic that is Weems Creek Nursery School. Applications for the 2019-2020 school year will be accepted as of January 21, 2019. The schedule will include time to play and eat lunch. At the beginning of the year, the schedule will also allow students to adapt to a longer school day by incorporating "quiet time" before diving into new learning. Once started, children will be solving a daily question or "challenge" following monthly themes that could range from seasons to reptiles. Open to our PreK and Young 4s students, this M/W/F program is sure to pique your child's curiosity and give them plenty to talk about at dinnertime! For more information, please contact our STEAM teacher, Marisa Corona, at mlcorona.lee41@gmail.com, or Kate Marriner, our school director, at katem@weemscreeknurseryschool.com. Mary Ostrowski shares her perspective on education on this podcast with Scott MacMullan. Please join us in welcoming educator and new owner, Mary Ostrowski, to our Weems Creek Nursery and Kindergarten Community. We hope you will take this opportunity to meet and hear her exciting plans for our school, ask questions and most of all, share in the love of Weems Creek Nursery and Kindergarten. The Weems Creek Summer Session for this year will be held from June 5th -29th. Camp takes place 9-1, Monday through Thursday. An exciting 4-week program full of summer activities and fun for children ages 4 -6 is planned. Some of our group activities include water play, games, art projects, story time, cooking, music and other special events! Please note that snack will be provided each day as well as milk for lunch. Summer camp information packets and tuition bills will be sent to all enrolled by April 21, 2016. Tuition must be paid in full prior to Friday, May 12, 2016. With thoughts towards summer and warm weather, I thank you for your interest in our Summer Camp! For more information to register, give us a call or send us an email.